This fabulous new 25,000 sq. 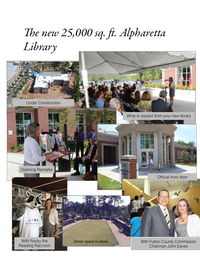 ft. library opened July 30 in the heart of Alpharetta, Georgia. 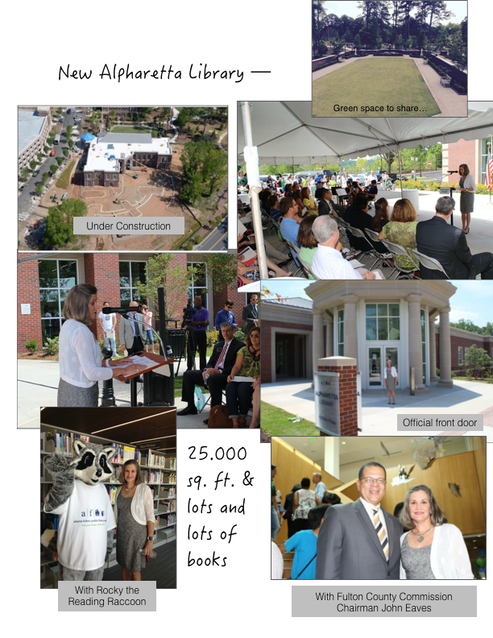 The collection includes not only traditional hard cover and paper back books, but also graphic novels, audio-books, e-books, CDs, and DVDs. There is even access to Hoopla, a free streaming link to movies, audio-books, and music - a link you can access 24/7 with only your library card and mobile phone. You’ll have 90 subscriptions housed here including WEB MD, The New Yorker, Organic Life, Southern Living, USA Today, the New York Times, the AJC and maybe even the Alpharetta Neighbor. Children’s periodicals include American Girl, Highlights for Children, Kids Discover, National Geographic Kids and Ranger Rick among others. There’s even a 150-seat theater, multiple conference rooms, mondo screens for video conferencing, a special teen area and, of course, a separate children’s area.